The Han EasyCon connector has had its dimensions reduced to accomodate the increasing trend for miniaturisation in the railway industry. HARTING has optimised the dimensions of the Han 16 HPR EasyCon so that there is enough room for two to four high-current contacts (up to 2 x 650 A) in even a small installation space. Power can be supplied to rail vehicle compressors, single-wheel drives and ventilation systems within this performance range. 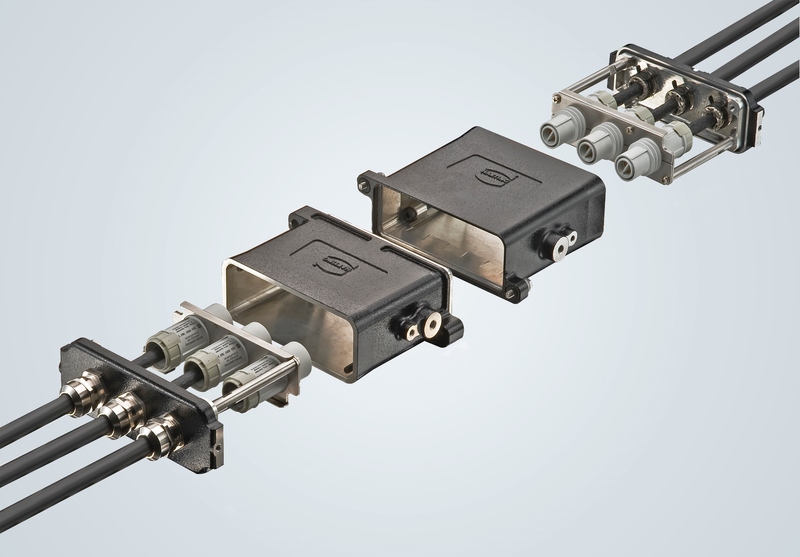 Delivering compact performance, this new connector addresses the trend for miniaturisation in the rail sector. The Han 16 HPR EasyCon covers all the essential requirements for a rail vehicle interface. It combines a high transmission capacity, an extremely compact build and the highest possible number of contacts for the available installation space with a robust and reliable design. The two-part housing provides plenty of space for cables and is easy to install. HARTING also provides accessories for easy additional tension relief and cable shield connections. In addition to the high-current contacts, the new connector can also be installed with six different Han-Modular modules – for power and signal transmission, for example. The Han 16 HPR EasyCon is the only HARTING housing in this size with a frame with enough room to accommodate so many modules. Users can save a quarter of installation space compared to the next connector size up with this option. The Han 16 HPR EasyCon is the flagship of the HARTING range for the rail sector: alongside the Han 34 and Han 24 HPR EasyCon, it is the ideal connector for applications requiring connectors with smaller dimensions – addressing the trend for miniaturisation.